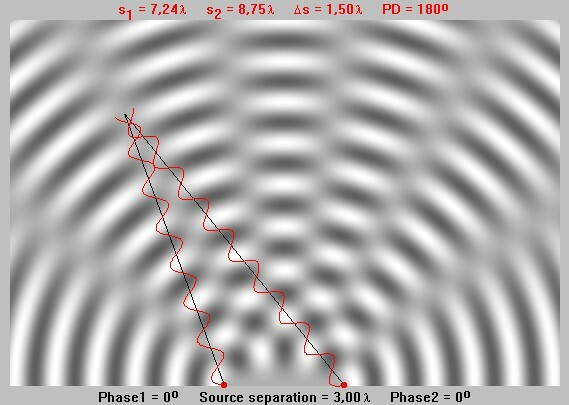 We saw at the beginning of class today what a two dimensional interference pattern might look like. In this case, we looked at a ripple tank, a tank filled with water with two vibrating rods. Instead of there being nodal points (regions of destructive interference) and anti-nodal points (regions of constructive interference) there are nodal lines and anti-nodal lines. The grey areas on nodal lines where the crests of one source overlap with the troughs of the other source. Whereas the bright and dark Zebra like regions are constructive and destructive interference because of the depth of the water. Here is a great Google Earth image of this phenomena occurring in the Chao Phraya River, Bangkok, Thailand. We can play with a PHET simulation to look at this with an simulated ripple tank created by two dripping faucets. 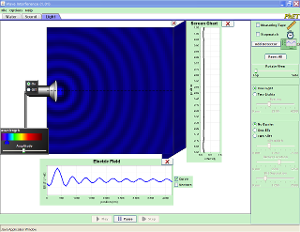 This simulation also allows us to look at the interference of sound waves and light waves. You are probably familiar with the cancellation of sound waves when it comes to noise cancelling headphones, which I used to wear when I flew planes. Most concert halls also have dead spots where the acoustic waves tend to cancel out. More interesting is that even light waves can cancel out. When we get to optics we will study how optical interference patterns are the basis of diffraction gratings and holograms.